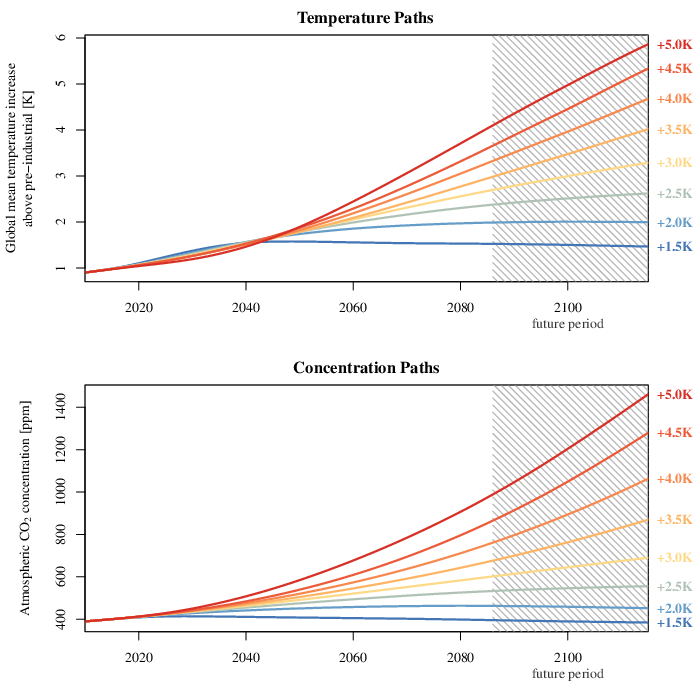 Trajectories of global mean temperature increase and corresponding atmospheric CO2 concentration. Source: CC-BY Heinke et al., 2013. Heinke, J., Ostberg, S., Schaphoff, S., Frieler, K., Müller, C., Gerten, D., Meinshausen, M. and Lucht, W. (2013): A new climate dataset for systematic assessments of climate change impacts as a function of global warming, Geoscientific Model Development, 6, 1689-1703, doi:10.5194/gmd-6-1689-2013. 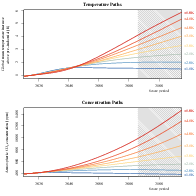 Global land-surface area at risk of major or at least moderate ecosystem change by around 2100. Source: CC-BY Ostberg et al., 2013. If you use any of the data available on this website in a publication, please tell us, and we may add it here.